Traumatic brain injury (TBI, also called intracranial injury) occurs when an external force traumatically injures the brain. TBI is a major cause of death and disability worldwide, especially in children and young adults. Causes include falls, vehicle accidents, and violence. Brain trauma can be caused by a direct impact or by acceleration alone. In addition to the damage caused at the moment of injury, brain trauma causes secondary injury, a variety of events that take place in the minutes and days following the injury. These processes, which include alterations in cerebral blood flow and the pressure within the skull, contribute substantially to the damage from the initial injury. 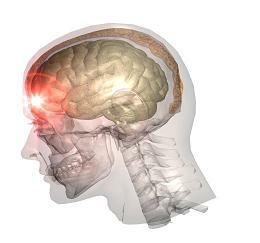 TBI are classified as closed or penetrating head injury. Closed (also called nonpenetrating, or blunt) injury occurs when the brain is not exposed. A penetrating, or open, head injury occurs when an object pierces the skull and breaches the Dura mater, the outermost membrane surrounding the brain. Prevention measures include use of technology to protect those who are in accidents, such as seat belts and sports or motorcycle helmets, as well as efforts to reduce the number of accidents, such as safety education programs and enforcement of traffic laws. Goal of occupational therapy is to restore the person to an optimal level of functioning in all areas. Other goals include reestablishing occupational performance skill, sensorimotor integration and control, and integration of perceptual, cognitive, and communication skills with activity of daily living. Compensatory techniques are also taught when remediation is not possible. Occupational therapy also improves on instrumental of daily living, community reintegration, and work re-entry.